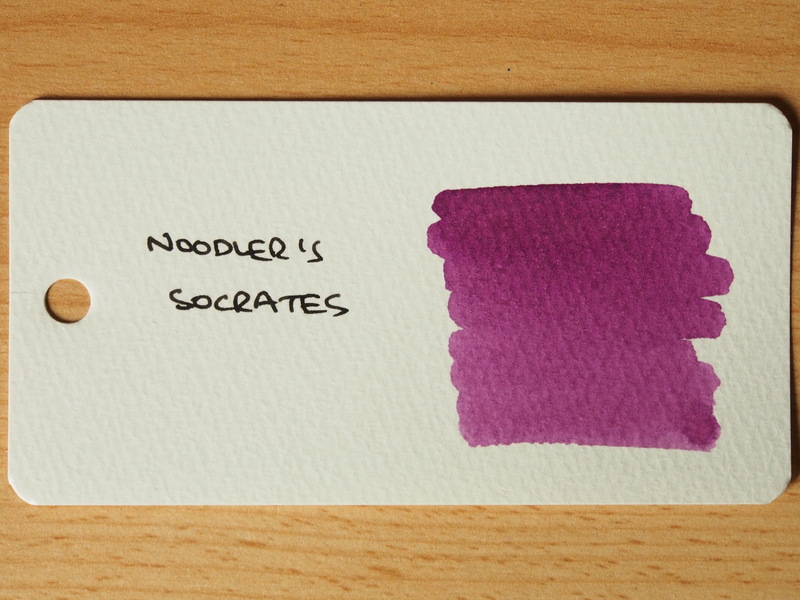 I don’t know if this is the real reason that this Noodler’s ink is called “Socrates”, but in Book IV of Plato’s Republic, Socrates states that purple is the most beautiful colour. Google, you are a wonderful thing – without you I would not have made that connection. 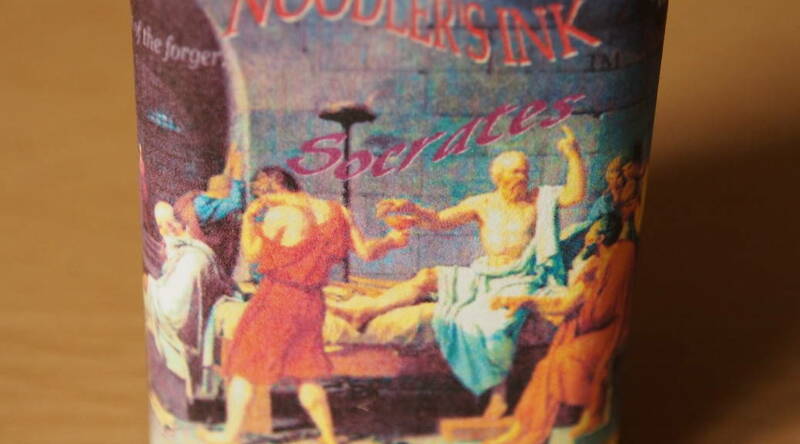 This is one of Nooodler’s Eternal inks, supposedly resistant to attacks by forgers. 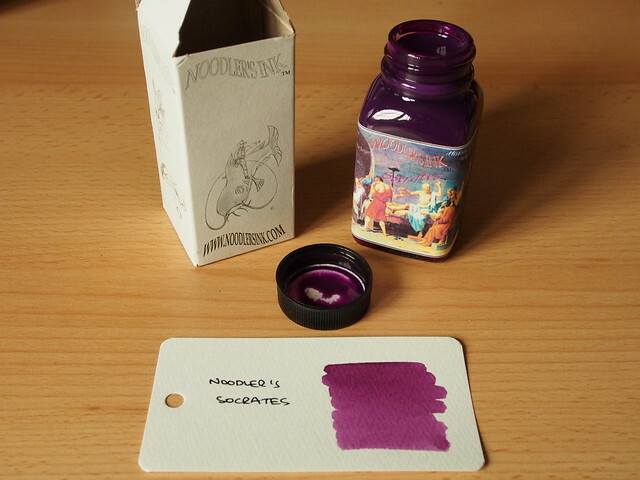 The ink was purchased from a UK supplier, priced at £12.50 for a 3oz bottle, so I would still consider it modestly priced. The box and bottle hold no surprises. The label depicts The Death of Socrates, as painted by Jacques-Louis David. “David – The Death of Socrates” by Jacques-Louis David – http://www.metmuseum.org/collection/the-collection-online/search/436105. Licensed under Public domain via Wikimedia Commons. 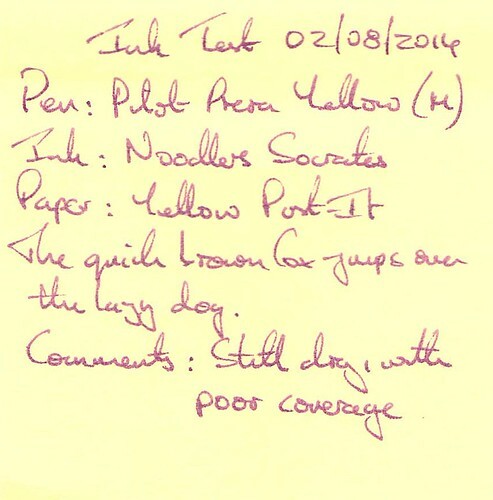 The test pen in this case was a yellow Pilot Prera, providing and interesting contrast with the ink. 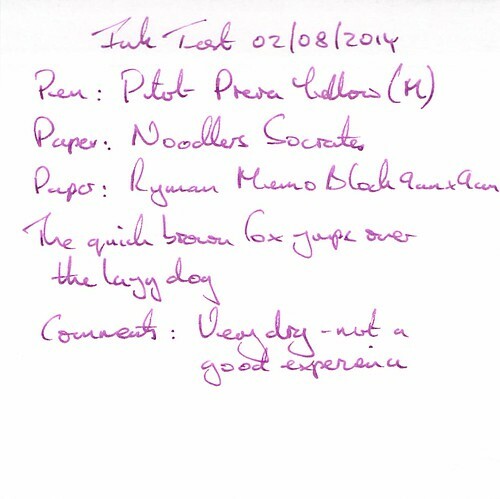 Not surprisingly for an eternal ink, water resistance was excellent. Cleaning was more difficult than usual, and pen flush did help. The drying time was a little extended at around 30 seconds. I’ll get it over with now – I don’t like this ink. The colour really doesn’t do anything for me – I like purple inks to either be so bright so they pop off the page, or saturated and intense. This ink is too bland and subdued. 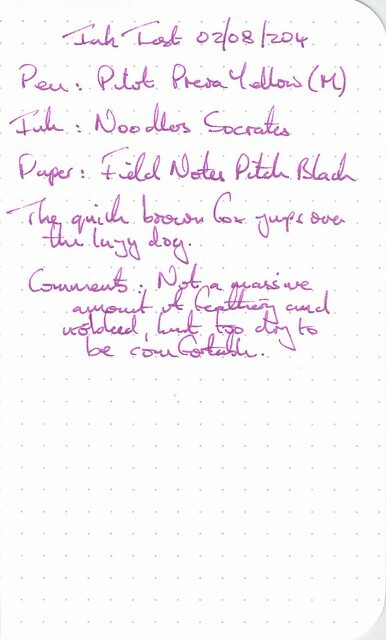 It’s dry behavior could be useful for taming an overly wet pen, but why bother if I don’t like the colour? Writing on this paper was so dry as to be almost uncomfortable. 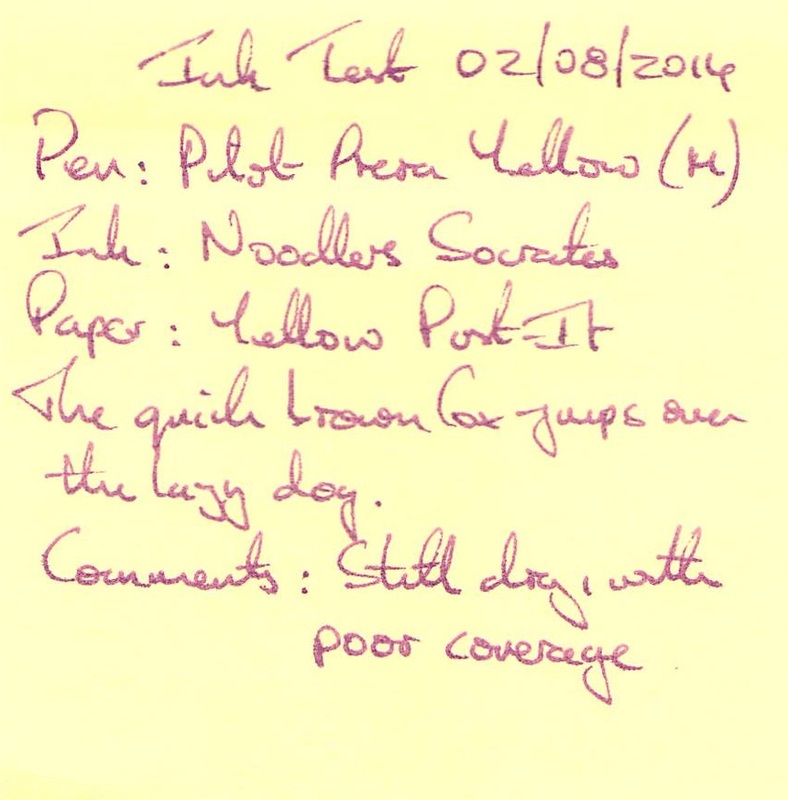 Dry again, with poor coverage – the colour doesn’t even give a bold contrast with the paper. One of the better performers on this paper – but still feels very dry. Washed out and leaning toward magenta – really not my thing. 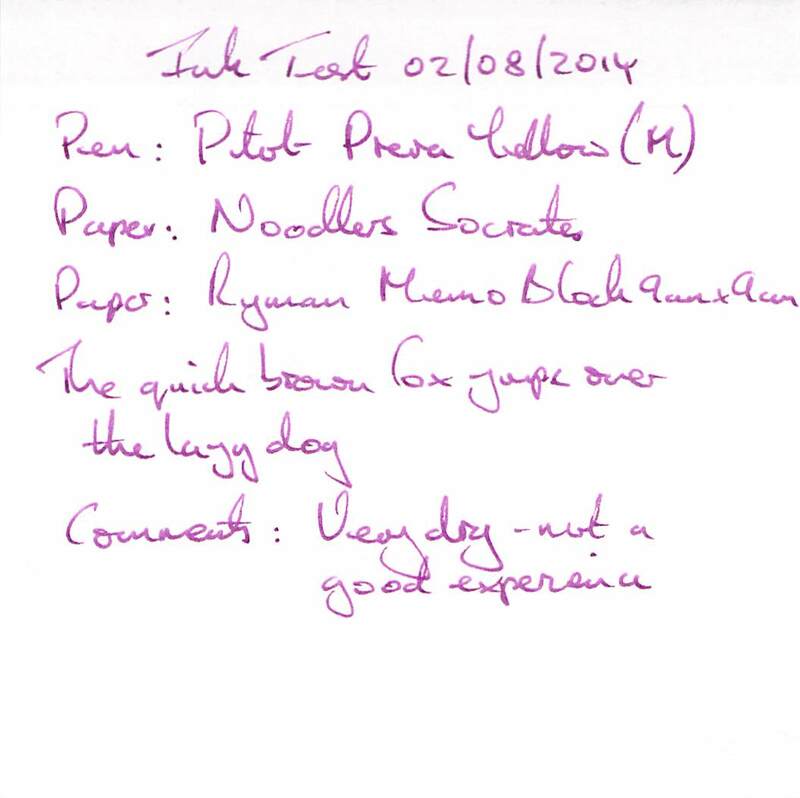 While the eternal properties are a positive, I suppose the flipside is the difficulty cleaning the ink out of the pen. 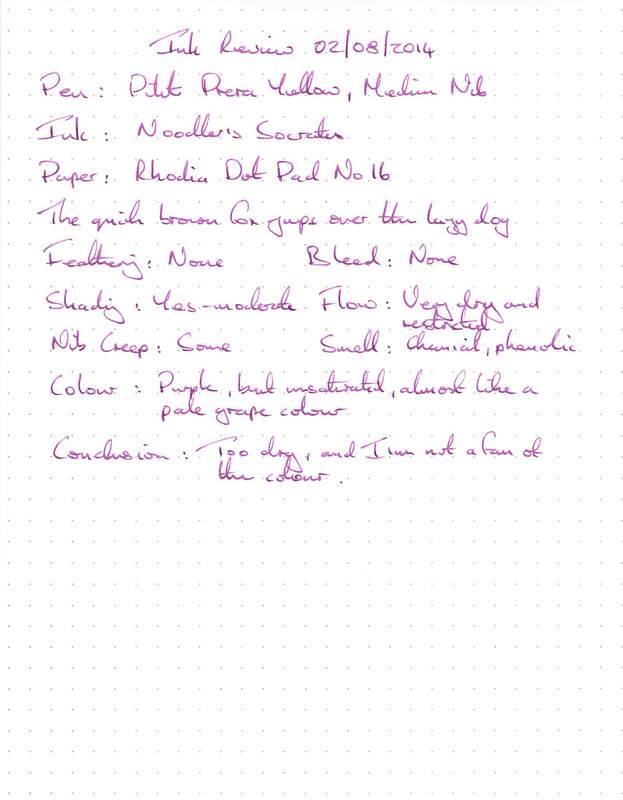 This is one of the driest inks I have tried so far, which coupled with the bland colour means I won’t be in a rush to use it again.